So, all weekend I thought about the post from Friday. I really, truly, tried to have a "laughing at the days to come" spirit. If you are anything like me, you need a little push some days. Some days you just need a focus to zoom in on so that you won't get side tracked, or even heaven forbid--thrown off the track. My focus this weekend was being lighter. Any time a "heavy" thought came to my mind, I immediately forced a smile upon my lips and chased that thought away at mach speed with Truth from His Word. Girls, no matter what is going on in your life right now, you can choose laughter. You can choose joy. You can choose to see the grace and the joy in this very moment. It's certainly something we have to choose. Last Friday, the Lord presented some opportunities in my path that certainly could have warranted a growl and a grimace from my lip-glossy mouth. However, I thought of our Proverbs 31 example, and threw my head back with a hearty laugh instead. Seriously, I did. I was at home by myself several times when I did this. I'm sure an onlooker would have thought I was taking a ride on the crazy train. Perhaps, I was. But, it felt good. Imagine how the enemy must hate it when we react positively in a negative circumstance. How he must scowl. The enemy fully expects us to give in and to lose our peace and joy. Oh, but when we feel God's presence even in the chaos and the messes, it will surely bring a smile to our lips. A radiance to our faces. Now, let's imagine what the world will see. They will see a woman who is unfazed by her circumstances. They will see a woman who, although someone has mistreated them at the check-out counter, or took the parking space they were waiting on, they smile and offer grace instead of sarcasm and anger. They will see a woman who whole-heartily trusts in the Lord, not in her circumstances. Imagine how this would effect all around us. Our friends, our husbands, our children. Whew, talk about a profound influence this unfazed woman would have! I believe we can be that woman. I do! We just have to practice it, day in and day out. 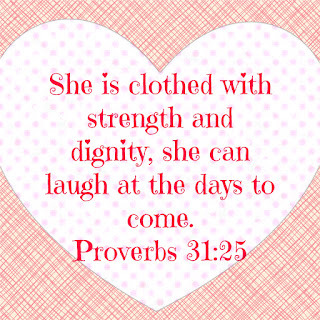 Will you clothe yourself with strength and dignity today? Will you choose to trust Him in all of the chaos and messiness that surrounds us? Will you throw that pretty head back and laugh a hearty laugh with me? Many are watching you. They want to see an unfazed woman desperately. They want to see a woman filled with Hope, Joy, Love, and Grace. Let's show them this woman.